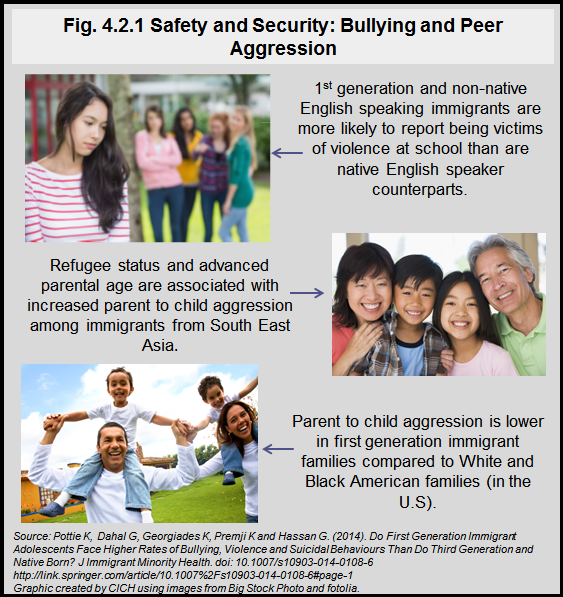 The findings depicted in this infographic suggest that experiences of bullying and peer aggression are higher among immigrant youth who are first generation and do not speak the country’s official language(s) when compared to third generation and native-born youth. This suggests that the risks related to violence are greater when immigrant youth speak a language other than the primary language of their new country.1 While this review only revealed findings based on American studies, the implications for Canadian immigrant youth are important. Studies showed that in most cases, a supportive, cohesive family – where all members live together – is associated with less violence. This research may indicate that there is a period following immigration for youth that is particularly critical. We need further research to fully understand this – and particularly to look carefully at the effects of socioeconomic status, gender and ethnicity. There may be other factors that make this worse – such as high academic standing – and factors that can help alleviate this risk, such as safe schools, ethnic diversity within schools and family cohesion. Immigrant parents grapple with both instilling and maintaining their cultural heritage and helping their children integrate into Canadian culture. When the values of these two cultures are in conflict, the result may be increased cultural dissonance and risk of conflict and violence.